The Remains of Crowland Abby. 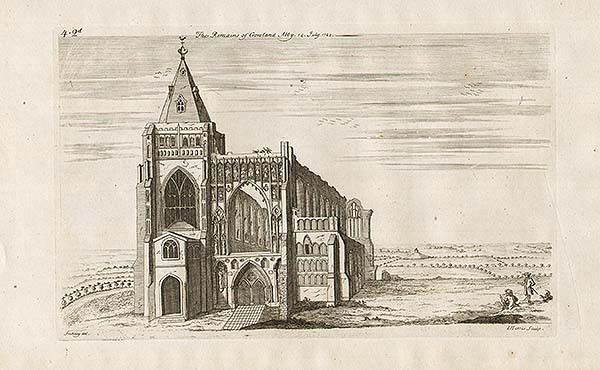 An antique line engraving by I Harris of The Remains of Crowland Abby which appeared in William Stukeley's 'Itinerarium curiosum' (London: 1724). South West view of Croyland Abbey. A View of Crowland Abbey in Lincolnshire. An antique line engraving. Circa 1780. An antique line engraving by J. Shury after T. Allom. Published by John Saunders in 1830. Later coloured by hand. An antique line engraving by W. Watkins after J.N. Rhodes. Published in 1832. Later coloured by hand.